Alpha lipoic sustain 300 is in a bilayer quick release/sustained release format to maximize blood levels and to minimize gastric irritation and blood sugar fluctuations. Alpha lipoic acid is a unique lipid and water soluble antioxidant that is a cofactor in energy production; helping to regulate glucose metabolism. Ala also promotes the synthesis of glutathione. Biotin is added for optimum ala activity. The advanced bilayer technology combines 1/3 quick release and 2/3 sustained release formats to both immediately raise and to maintain blood levels over a longer period of time. Keep out of the reach of children. 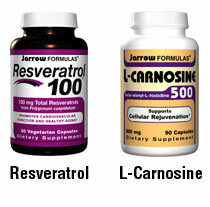 A unique lipid and water soluble antioxidant that is also a cofactor in energy production. View larger. Useful for anyone who seeks prolonged universal antioxidant protection throughout the body. View larger. Alpha lipoic acid (aka ALA, lipoate, thioctic acid) is utilized as an antioxidant and co-factor in glycolysis. Glycolysis is the initial process in most of the body’s pathways to breakdown glucose into useful forms of energy. Though critical to life, ALA is not a vitamin because it can be synthesized from essential fatty acids and the amino acid L-cysteine. However, no food is rich enough to serve as a good source. Chemically, ALA has two juxtaposed sulfur atoms. When oxidized, the two sulfurs bond together (disulfide form). When reduced to dihydrolipoic acid, the active antioxidant form, each sulfur atom attaches to hydrogen (thiol form). ALA’s antioxidant chemistry is similar to glutathione, another sulfur-containing molecule and the most abundant antioxidant inside cells. Perhaps the most significant function of ALA is its important role in energy production from carbohydrates, participating in the multi-enzyme process on many levels. ALA stimulates insulin activity and enhances glucose burning in overweight laboratory animals. Similarly, glucose utilization was supported in humans. * This also has implications for athletes and the overweight since muscle activity requires efficient sugar metabolism. Protection is highly dependent upon the usage regimen. 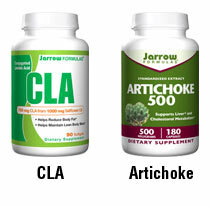 ALA is rapidly cleared from blood by the liver, so it is best supplemented in multiple, divided servings. 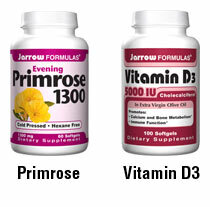 Clinical studies typically employ 300 mg taken twice daily. Alpha Lipoic Sustain 300 keeps ALA in circulation for much longer periods than the usual tablet or capsule delivery. Sustained release may also help avoid stomach irritation experienced by sensitive individuals. Since biotin and ALA have similarities in structure and are transported by the same mechanism, elevated dietary ALA can interfere with biotin absorption and coenzyme functions. To protect against biotin deficiency, Alpha Lipoic Sustain 300 contains over 100 percent of the recommended daily allowance for biotin. Note: If you have a medical condition (especially diabetes or being treated for glucose control), are pregnant, lactating, or trying to conceive, are under the age of 18, or are taking medications (especially for glucose control), consult your health care practitioner before using this product. No serious side effects are associated with ALA. Very rare side effects include allergic skin reactions, and possible hypoglycemia in diabetics from improved glucose utilization. Warning: Pregnant/lactating women and those with diabetes or using glucose control medication, should consult a health care professional before using this product. 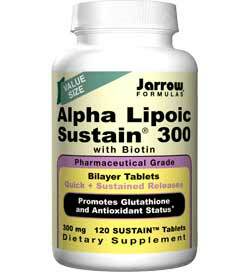 Jarrow Formulas Alpha Lipoic Sustain 300, 300mg, 120 Bilayer Tablets. 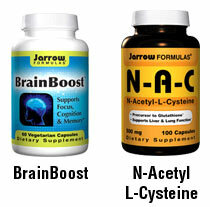 Tagged Alpha, Cardiovascular, Formulas, Health, Jarrow, Lipoic, Supports, Sustain, Tabs. Bookmark the permalink. Come out of the fog!